This photo is of Mt St Helens, taken in November or December 2000. It is one of my favourite photos, and was taken with a Canon A2 film SLR. 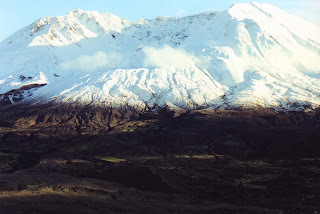 The striking part of this photo is the snowline, which makes for a very stark contrast with the peak and the higher altitudes, bathed in pristine white snow, and the lower half, barren dried lava. One of the challenges in such photos is deciding on the exposure. Almost any camera's exposuring system is going to be challenged with such a composition. If you expose for the snow, the barren landscape in the bottom half is going to be too dark to make out any details. If you expose for the barren landscape, the snow is going to be too washed out white. If you try something of a compromise, well, nothing's going to be rightly exposed. But, there is NO right exposure. It's all about how you want the photo to come out. One obvious solution is to bracket. If you have a digital camera, you can see the results instantaneously, and adjust the exposure accordingly. Another solution would be to use a one or two-stop neutral density graduated filter such that the snow is darkened enough to retain details in both the snowed region as well as the landscape. Photoshop geeks would also argue that you simply shoot a RAW image, and then process it in Photoshop.